Nobody dislikes the comic strip Calvin & Hobbes. This is the premise of the documentary Looking for Mr. Watterson, and one I can personally attest to — I have never met a single person who didn't enjoy the wonderful art, the humor, the philosophy and/or the strip's creativity. I only know people who haven't read Calvin & Hobbes yet. This movie is made for that latter group — it's sincere, but just a little shallow. The problem is that if you love Calvin & Hobbes enough to watch a documentary on it, then chances are you're also interested enough in the strip to already know most of what happened behind-the-scenes: creator Bill Watterson was and is a recluse, he famously refused to license the characters despite the strip's incredible popularity and the piles of money he stood to make, and he quit the strip in 1995 in large part in protest over the diminishing size of the comics page in newspapers. That's all Calvin & Hobbes 201 — the stuff you learn immediately after you start searching beyond the strip itself. There's very little here that you can't get from Watterson's Wikipedia page. And if you don't know these tales at this point, I have to imagine that you're also not going to spend 90-minutes watching a documentary on the comic strip, either. Director Joel Allen Schroeder is in the very small part of the Venn diagram where he loves Calvin & Hobbes and yet apparently at no point ventured to learn a single additional thing about the strip or its creator until he started making this documentary, which consists of little beyond these very basic revelations. That's not to say Dear Mr. Watterson is wholly without substance; it's cool to hear from Watterson's contemporaries, both cartoonists and syndicate people alike, and it's also nice to hear from today's artists about how Calvin & Hobbes influenced them. Additionally, the film's design work — the way it "draws" the strips on-screen — is both tasteful and elegant, but that's hardly a substitute for substance. The biggest problem is that Watterson himself is nowhere to be found. It's not surprising, of course; the man has turned down 99% of all interviews offered to him even during the height of Calvin & Hobbes' fame, and refused 100% of the photos people wanted to take of him — why would he change his mind now just because a fan got it in his head to make a documentary? But his absence is a gaping hole in the film, a silence that practically drowns out everyone else who has to speak for him, many times guessing what Watterson was thinking and doing. As such, Schroeder scrambles to fill up the movie's 85-minute run time, and it's obvious. The film's first 32 minutes contain little but repetitive fan and professional praise for the strip, as well as a shockingly lengthy scene where Schroeder goes into the archives of the Chagrin Falls, Ohio library (where Watterson lived, and used frequently for his art) to read old Calvin & Hobbes strips on camera) so it's a long time before the documentary even gets around to the limited information it has to present. We know already Calvin & Hobbes is pretty great; that's the whole reason we've bothered to watch this thing in the first place. In the end, Dear Mr. Watterson is well-meaning and certainly reverent, but a documentary that consists of little but people hypothesizing about what Bill Watterson was thinking and doing isn't much of a documentary. 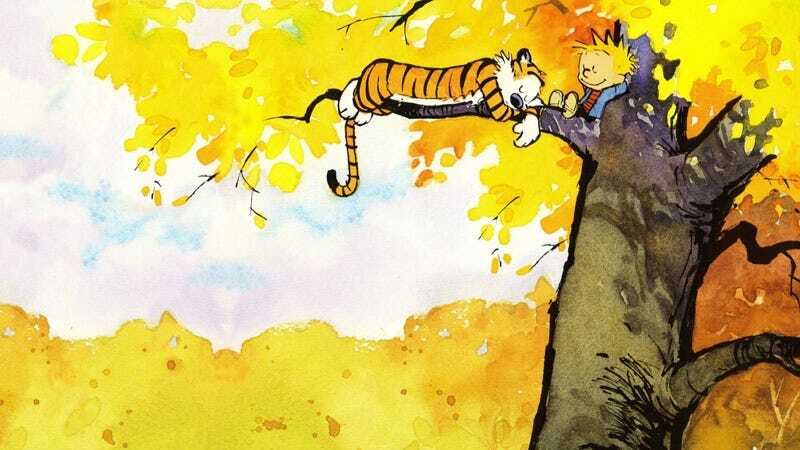 Dear Mr. Watterson may be a love letter to Calvin & Hobbes and its creator, but until Mr. Watterson decides to write back, it doesn't have much to talk about.